I like a spring mix salad for lunch but when I want to feel less hungry as the day gets longer, I need something more. 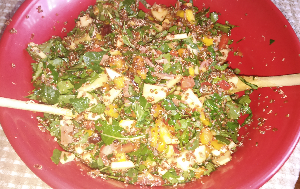 So I created a kale and grain bowl that is loaded healthy ingredients. The following ingredients list makes up enough for a large bowl that I cover and store in the fridge for the week (though it usually does not last the week!). Mix the apples in with the rest of the ingredients using large salad spoons. And it’s ready to go! Cover the bowl and store it in the fridge for the week. I put my serving ( I learned not to take too much because it is very filling!) into my lunch container the night before work. Add a little balsamic vinaigrette dressing and mix it up. Cover it and put it in the fridge over night. Your lunch is ready for the next day and you have a very healthy meal! This entry was posted in Health, Nutrition, Recipes, Wellness and tagged healthy nutrition. Bookmark the permalink.